We’d love your help. 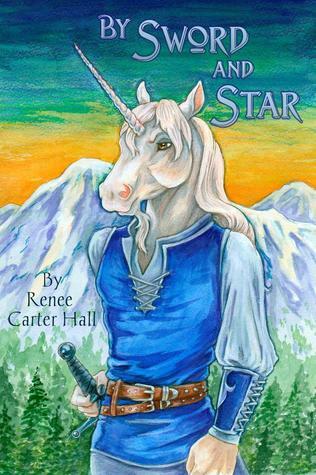 Let us know what’s wrong with this preview of By Sword and Star by Renee Carter Hall. Prince Tiran of Silverglen may be heir to the throne of all Asteria, but he's always felt more at home among the villagers, no matter how many lectures he gets from his father. But when the elk-lord Roden slaughters the royal family and claims the throne for himself, only Tiran is left to avenge their deaths and take his place as the rightful king. His journey will lead him Prince Tiran of Silverglen may be heir to the throne of all Asteria, but he's always felt more at home among the villagers, no matter how many lectures he gets from his father. But when the elk-lord Roden slaughters the royal family and claims the throne for himself, only Tiran is left to avenge their deaths and take his place as the rightful king. To ask other readers questions about By Sword and Star, please sign up. I had known of this story for some time, much to my chagrin, before reading it. In fact, I ended up with a free copy for reviewing. I can definitively state that I will be purchasing a copy with my next paycheck. At first blush, it seems like a familiar tale. Bratty prince goes through ordeals and grows up to be a proper king. There's a dozen other tales along those lines. Some might compare it to such works as The Lion King or even The Emperor's New Groove. Doing so, however, would do this stor I had known of this story for some time, much to my chagrin, before reading it. In fact, I ended up with a free copy for reviewing. I can definitively state that I will be purchasing a copy with my next paycheck. At first blush, it seems like a familiar tale. Bratty prince goes through ordeals and grows up to be a proper king. There's a dozen other tales along those lines. Some might compare it to such works as The Lion King or even The Emperor's New Groove. Doing so, however, would do this story a grave injustice. This is no mere Disney tale, whitewashed and politically correct. This is a more adult tale with a more realistic outlook on the price that is paid to put a crown on someone's head. Yet in all that, the author does an excellent job of avoiding the other danger, of reveling in vulgarity. You, the reader, are shown the prices that are paid, the love and the hate and the death of loved ones and friends... but it is also a story I would permit my young adult child to read. I will warn you now, this book is a face-hugger, and while I would never dare to call it literary junk food, the pages practically turn themselves and chapters vanish like popcorn at a double feature. You may find yourself drawn into the story as I was, wondering where the hours went as I close the final chapter. The author also did an excellent job in making the various cultures distinct and unique. Indeed, one of the undercurrents of the story is that the young prince must grow to understand the various cultures of his own people and his neighbors in order to find peace for his own nation. I could wish modern day rulers would gain such understanding of their neighbors, it might well be a better world if they did. When, not if, I purchase the book, it will rest on one of my several bookshelves. The author might not be as well known or as popular as, say, Mercedes Lackey, Ann McCaffery, or Lois McMaster Bujold... but I would say, as a reader, that the quality of her writing is easily on their level, and my bookshelf will be much improved for having this book snugly nestled in with the rest. It is not just that the story has everything necessary for a good novel: magic, murder, betrayal, love, sacrifice, temptation, honor... it is that the author weaves these into a whole greater than the sum of its parts. It has been some time since I have read a story this gripping. This is a well crafted example of a furry fantasy fable. The world is richly developed, the mythology established. The writing style is eloquent and lyrical. And most importantly, the characters are interesting. It has faint echoes of Redwall - the fierce squirrels, the brave rabbits but also a darker and more mature side. In particular, I liked the presence of the half-Awakened animals - the idea that animals could become intelligent in mind and spirit without becoming anthropromorphic appealed This is a well crafted example of a furry fantasy fable. The world is richly developed, the mythology established. The writing style is eloquent and lyrical. And most importantly, the characters are interesting. It has faint echoes of Redwall - the fierce squirrels, the brave rabbits but also a darker and more mature side. In particular, I liked the presence of the half-Awakened animals - the idea that animals could become intelligent in mind and spirit without becoming anthropromorphic appealed to me. A well-written, full adventure that was perfectly paced. Easy to put down and pick up again due to the plot always being coherent, but a book I didn't want to put down if I could avoid it. I would very much reccommend it to fantasy fans and fans of Redwall-- while it was reminiscent of Redwall, it defininitely had its own vibe, style, world, and maturity that. On a side note, the wonderful, amazing dialogue was probably my favorite part of the book. By Sword and Star is a fantasy novel set in a world of anthropomorphic animals and it Before I start, I'd like to mention that I'm friends with the author. It's hard to avoid it, since my name is featured in the acknowledgements, but that's because I've been a fan and supporter of Renee's work for many years. And once again, By Sword and Star did not disappoint. It's just as good when I read it the second time (which I rarely ever do), and it proves that Renee is an exceptionally talented writer. I first found out about this book when it was featured on the Furry Writer's Guild blog's Book of the Month. The premise sounded interesting, and I was, and still am, new to furry fiction; so I figured I get the ebook version when I get the chance. This whole novel was a just a fun adventure, and Hall didn't give an excessive amount of world-building to tell it. Even though there were a quite a few different locations mentioned: Silverglen, the Drays village, the wolf den, the plains of the Child I first found out about this book when it was featured on the Furry Writer's Guild blog's Book of the Month. The premise sounded interesting, and I was, and still am, new to furry fiction; so I figured I get the ebook version when I get the chance. This whole novel was a just a fun adventure, and Hall didn't give an excessive amount of world-building to tell it. Even though there were a quite a few different locations mentioned: Silverglen, the Drays village, the wolf den, the plains of the Children of the West Wind, the Spring, Neoma's cottage, and any place else I forgot, we only spend a lot of time in only three of these, which I like. I like the idea of a prince who'd rather be among his people and directly help and interact with them than be in his comfy castle. I don't know if that trait has been done before, but this is the first time I've seen it; it's a neat idea for a unique character who's also royalty. Still, in some ways, Tiran's kind of an underdog. At first, he's not very agile, he's not all that great with a sword, and he always seems to get himself in awkward situations, especially with women. I feel bad for Alderic, as he was, and still is, Tiran's bodyguard and is almost like a second father to him. It's interesting how most of the characters are anthro and look more like humans, but others are feral, like the Children of the West Wind and Var. I also like how the Children and the wolves are very tribal and natural in their ways and, in some cases, against the culture Tiran knew all his life. By Sword and Star is a story involving anthropomorphic characters. The main character is Prince Tiran, a unicorn of the royal family. The enemies that have taken his family and heritage from him are the elk lead by Roden. The elk and unicorn characters seem to be pretty much human in behavior. The other species exhibit more animal characteristics especially the wolves and squirrels. I actually really enjoyed those two groups and the parts that they played. The wolves are a bit more primitive, li By Sword and Star is a story involving anthropomorphic characters. The main character is Prince Tiran, a unicorn of the royal family. The enemies that have taken his family and heritage from him are the elk lead by Roden. The elk and unicorn characters seem to be pretty much human in behavior. The other species exhibit more animal characteristics especially the wolves and squirrels. I actually really enjoyed those two groups and the parts that they played. The wolves are a bit more primitive, living in caves, struggling to survive the harsh environment. The squirrels are more of an elite fighting group using their crazy agility to give them an advantage in combat. The story itself is pretty familiar with the lost prince coming for revenge against the rebellious noble who killed his family. The animal characters are what really set the book apart from all of those other stories. This book only took me 2 days to read so it's a quick, but enjoyable read. This book should work well for general fans of fantasy, but especially for people who enjoy the anthropomorphic subgenre. The unicorn prince isn't looking forward to taking the reins of his father's kingdom, but when his family is murdered and he is ousted from Astoria by elk usurpers, it's up to Teiran to fix things. His quest to gather an army takes him to the treetop world of the squirrels and the bleak, snowy territory of the wolf people. I liked By Sword And Star very much - it has humour, romance and character development, in a detailed and delightful fantasy setting. I would say 'fans of Redwall will enjoy t The unicorn prince isn't looking forward to taking the reins of his father's kingdom, but when his family is murdered and he is ousted from Astoria by elk usurpers, it's up to Teiran to fix things. His quest to gather an army takes him to the treetop world of the squirrels and the bleak, snowy territory of the wolf people. I had some trouble with the story at first, mostly with the too convenient coincidences: characters who knew more than should be expected, characters who appear at the right place, at the right time… but between the plot and the solid worldbuilding, I read the second half of the novel in one sitting (the writer owes me a few hours of sleep!). All in all, and considering that this is a first novel, I'd give it four stars and a half. Liked the book and the cahracters, would like to hear more about how the animals came to be more than they used to be. Also would like to hear more about the cat and see if he will find any more of his kind, and about the the horses and why exactly they were only half gifted. Renee Carter Hall writes fantasy and science fiction for adults who never quite grew up, with occasional excursions into dark fantasy, poetry, and stories for children and teens. Talking animals slip into her stories whenever they get a chance, and her work has been influenced by storytellers from a range of media, including Steven Spielberg, Ray Bradbury, and Jim Henson. Her most recent book, the Renee Carter Hall writes fantasy and science fiction for adults who never quite grew up, with occasional excursions into dark fantasy, poetry, and stories for children and teens. Talking animals slip into her stories whenever they get a chance, and her work has been influenced by storytellers from a range of media, including Steven Spielberg, Ray Bradbury, and Jim Henson. Her most recent book, the anthropomorphic fantasy Huntress, received the 2014 Cóyotl Award for Best Novella.